This is a listing of articles under the purview of the Military and Engineering Workgroups that have been designated as particularly relevant to the Measurement and signature intelligence Subgroup. List Measurement and signature intelligence as one of the subgroup categories (i.e., sub1, sub2 or sub3) as indicated by the B in the adjacent image. 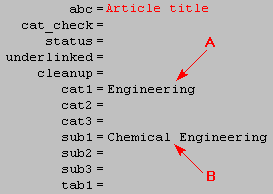 Update or add appropriate workgroup categories (i.e., cat1, cat2 or cat3) as indicated by the A in the adjacent image. Update the appropriate entries for cat_check, status, underlinked and cleanup; see here for a full explanation of these fields. It is often necessary to "jog" articles to make them display in workgroups and subgroups. "Jogging" is done by editing an article's main page and adding a blank space at the end of any paragraph. The Metadata page may list the article for inclusion in as many as 3 main workgroup categories plus as many as 3 subgroup categories. Pages in category "Measurement and signature intelligence Subgroup"
This page was last modified 07:06, 7 June 2010.